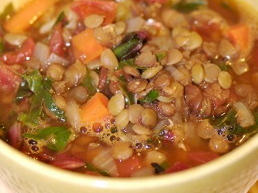 One of my all-time favorite soup recipes — Lentil-Spinach Soup — comes from The Greens Cookbook, one of my all-time favorite cookbooks. Over the years I’ve fiddled with the recipe, adding and substituting ingredients to suit my fancy, and this is what has materialized. I like to make a large quantity of this soup because it’s a good one to give away, and it freezes well, too. Place the lentils, bay leaf, and water (with the liquid from the canned tomatoes) into a large soup pot and bring to a boil. Once the water comes to a boil, skim off the surface foam and lower the heat to a simmer, keeping the pot partially covered. While the lentils are cooking, prepare the vegetables. Chop the onion and add it to a large sauté pan coated with just enough oil to cover the bottom, and cook over medium-low heat. While the onion is cooking, clean and chop the celery and peel and chop the carrots into a medium dice; add both to the pan with the onion. Stir vegetables and continue to cook, adding more oil to the pan if necessary to prevent them from sticking. Prepare the greens by removing the leaves from the stems; finely chop the stems and add to the cooking vegetables. Chop the greens finely and set aside. Add the minced garlic to the sauté pan, give a stir, then add the chopped tomatoes. Add the chopped greens, stir, and cook until wilted. Season to taste with salt, pepper, and a little red-wine vinegar. Serve hot, with or without the optional garnishes.